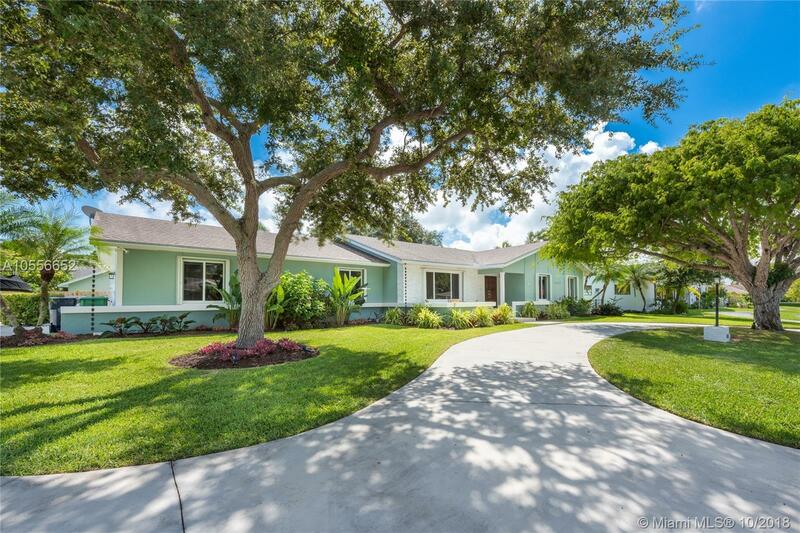 Magazine quality, one story Ranch style home in coveted Palmetto Bay. Fully renovated w/high end materials. Light filled, open living spaces w/ beautiful porcelain floors, custom cabinets thru out, impact windows & doors, chef's kitchen w/ double oven, sub counter micro. Quartz counters extending into bar top , 3 double sliding impact doors , laundry designed room, Soaker tub in 2nd bath, Aqua brass shower and faucet fixture w/ cabana door, luxurious master bath w/ Aqua brass faucets, expansive shower, oversize master closet. 1/2 bath to use by pool, which features new diamond bright pool and pump, mature lysosome and oak trees for lovely shade. New septic tank and drain field,& new sprinkler heads w/ timer. Neighborhood offers for a small fee access to tennis courts.